The call for papers for this special issue about Stanley Kubrick’s impact on contemporary culture listed as possible topics not only fairly predictable items such as “[f]ilmmakers and their works influenced by Kubrick” and “Kubrick works completed, or to be completed, by others”, but also, in a somewhat surprising self-reflective move, “Kubrick scholarship and the proliferation of revisionist works”. It is indeed the case that, for Kubrick fans and scholars, the filmmaker’s influence can perhaps be felt most strongly in the vast amount of academic (as well as other forms of) writing his work has generated. This statement applies to everyone who sets out to read up on Kubrick and tends to find much more material than they have bargained for, but it is, of course, especially true for those who are in the business of producing such publications. Writing as someone who has dedicated the better part of the last decade to read (much of) what has been published about Kubrick, to carry out archival research and to write up the results of this investigation, I can certainly say that, as far as my own experience is concerned, the filmmaker has a strong presence in contemporary culture in general, and in my working life in particular, precisely because his films seem to ask to be written about and so many of their viewers have responded to this call to writing. At the same time, Kubrick’s films – and none more so than 2001: A Space Odyssey (1968) – have, of course, inspired filmmakers, among them James Cameron whose movie Avatar (2009) would appear to draw in complex ways on the themes and iconography of 2001. It is no coincidence, then, that, in addition to my focus on Kubrick, I have also come to work on Cameron, especially Avatar. In the spirit of self-reflection evoked by the call for papers, then, I want to begin this essay with an account of my own development as a cinephile and film scholar, paying particular attention to the important role played by Kubrick’s and Cameron’s work in this, to the connections between these two filmmakers and to some of the underlying themes (to do especially with the very future of humanity), which have centrally shaped both their work and my own research interests. This will be followed by a discussion of preliminary results from the research I have conducted on the importance of 2001 as a source of inspiration for Avatar and as a potential reference point in the marketing of Cameron’s film. Rather than simply reporting these results, I also want to examine the process that generates them, because it is, I think, on occasion worth stepping back from the routines of academic research and pointing out some of the practical problems we encounter in our work as film scholars. I think – indeed in some cases, I know for sure – that I am not alone in saying that the desire to write about Kubrick’s films has changed the course of my life. When, within a few months in the late 1970s, I saw both 2001: A Space Odyssey and A Clockwork Orange (1971) at the cinema as a teenager, talking about the films, (re-)reading the novels they were associated with and watching them again (and again) simply was not enough. At the time, there was no obvious outlet for my strongly felt need to put something in writing, except for a school essay on A Clockwork Orange which had to be about the novel, however, not the film. Nevertheless the encounter with these two Kubrick films planted the seeds for my later decision to study film at university and to become a film teacher and writer (although it actually took me a long time to get round to writing about Kubrick). By the time I read these lines, I had not only published two essays on Cameron’s films up to and including Titanic (1997) and started to give papers on Avatar (which had been released in December 2009), relating its unprecedented success to the public debate about global warming,  but I had also, over the preceding one and half years, spent much time in the newly opened Stanley Kubrick Archive at the University of the Arts London and written extensively about 2001. In this context, Cameron’s statement on the importance of 2001 in his life resonated both with my own teenage experiences and with a reference to Avatar I had included in my BFI Film Classic on 2001, listing Cameron’s film as the latest example in a long string of Science Fiction movies, especially hit movies, influenced, and indeed made possible, by the success of Kubrick’s film. The passage from Keegan’s biography suggested that perhaps it would be worth exploring the connection between the two films in more depth. I was also struck by a second memorable passage from Keegan’s biography relating how Cameron in 1962, at the tender age of eight, had come across a pamphlet about civilian fallout shelters and subsequently realised that the world might come to a nuclear end at any time, a somewhat traumatic experience that informed much of his later work. Indeed, one way or another, The Terminator (1984), Aliens (1986), The Abyss (1989), Terminator 2: Judgment Day (1991) and True Lies (1994) all deal with the threatened or actual use of nuclear weapons. Since the mid-1990s, Cameron’s concern about the future had shifted from nuclear to environmental issues, treated allegorically in Titanic (1997) – in which the natural environment, in the form of a floating iceberg, brings down a ship that in turn stands in for a particular form of civilization – and then literally in Avatar (as well as in several of the documentaries he made after 1997). In fact, the threat posed by changes in the natural environment to the very existence of proto-human hominids also had been an important theme in the story development for 2001 and in Arthur C. Clarke’s novel which was written during the making of the film and became a bestseller in its own right (more about this novel later). From 2010 onwards, I have worked in parallel on Kubrick, with a special emphasis on his visions of the future in what we might call his Science Fiction trilogy (Dr. Strangelove, 2001 and A Clockwork Orange) and in various projects he worked on but never realised (notably A.I. Artificial Intelligence)  and on Cameron, especially on the ways in which Avatar’s projection of the future resonates in contemporary culture and politics, and on the diverse uses that audiences have made of the film. In the remainder of this essay I bring these parallel research strands together and explore the connections between Avatar and 2001, touching on the production history (and pre-history), the marketing as well as the themes and style of Cameron’s film. One of the issues any scholar doing work on Avatar has to confront is the extraordinary amount of potentially relevant material available on the Internet and elsewhere. In an extensive search carried out in April 2016 (using Google Scholar and Google Books as well as the JSTOR, Project MUSE and MLA databases), I found at least half a dozen English-language academic monographs, edited collections, special issues of journals and dissertations about Avatar, and well over seventy academic essays in journals and edited collections (excluding the special issues and edited collections wholly dedicated to the film). In addition to these secondary sources, Google searches (focusing once again only on English-language sources) revealed that there were DVDs and Blu-rays featuring different versions of the film and different sets of extras, several tie-in books (ranging from a novelisation to various making-of volumes), hundreds of professional film reviews as well as tens of thousands of users’ comments and amateur reviews, thousands of articles in the press (starting a few years before the film’s release), several fan websites with well over a million posts and a great diversity of other materials relating to the film’s production, marketing and reception. It is important to note that the vast majority of the academic essays I have been able to read refer only to a very limited selection of primary and secondary sources on Avatar. While this is no doubt also the case with regards to many other topics academics like to write about (another striking example is, of course, the scholarly literature on Kubrick), it does raise uncomfortable questions about the very nature of academic research: to what extent is it the responsibility of anyone setting out to write an interpretation of the film to familiarise themselves with all the existing ones? Why does most of the scholarly work on Avatar consist of such critical interpretations? What kinds of questions that we, as scholars, never even ask might we be able to answer on the basis of the richness of available primary sources? Or: how could we perhaps answer certain much debated questions better if we made better use of the available sources? While there is a lot to be said about this document (and indeed about the very concept of plagiarism), for the purpose at hand the most important item is the one reference it contains to 2001: “My favorite movie was 2001: A Space Odyssey (1968), in which Man, the explorer, meets an incomprehensible alien intelligence and undergoes a transcendental metamorphosis into a highly-evolved being.”  Unlike his discussion of most other items, Cameron never explicitly states that certain elements of Kubrick’s movie can also be found in Avatar. But it is difficult to miss the parallels between his summary of 2001 and what happens in Avatar. In the latter, humankind has explored the cosmos sufficiently to be able to colonise another planetary body, the moon Pandora in the Alpha Centauri star system, on which it ultimately has to confront the “incomprehensible alien intelligence” of Eywa, a global neural network of tree roots which in the end helps one man to transcend his earthly existence and human body so as fully to metamorphise into an alien being. There is an implied promise here that eventually all of humankind might learn to evolve to a higher level through its interaction with the life forms of Pandora, in the same way that in 2001 the transformation of astronaut David Bowman into a “Star-Child” was meant to signal that humanity could develop into a more highly evolved state. It is strongly implied here that if “[t]he Earth is dying”, then so, sooner or later, will humanity. Like Cameron’s scriptment, Clarke’s story begins with environmental changes (here natural rather than human-made) threatening the future, in this case of proto-human hominids. Cameron keeps overpopulation but replaces the threat of nuclear war with that of environmental degradation (specifically mentioning “global warming” on the first page). This then is the reason why humanity, both in 2001 and Avatar, needs to encounter an “incomprehensible alien intelligence”: without such an encounter it will simply destroy itself. At the beginning of Clarke’s novel the threat to the very survival of the proto-humans is linked to personal loss, when the protagonist of the novel’s first part, Moon-Watcher, finds out that “his father had died in the night”; although he does not fully comprehend that it was indeed his father, “he felt a dim disquiet that was the ancestor of sadness”, before he carries the corpse away from his cave to a place (the equivalent of a burial ground) where it will be eaten by hyenas. This initial death is counterbalanced by the rebirth of astronaut David Bowman, the protagonist of Parts 3-6 of the novel, at its very end. “[A] baby opened his eyes and began to cry”, are the last words of Chapter 45,  and the remaining two chapters then relate how the reborn human, who has achieved a higher level of consciousness, returns to the orbit of Earth, as a largely immaterial (spiritual?) entity, and with his new found powers harmlessly explodes the nuclear weapons circling it, so as to protect humanity from itself. While there is no newborn child here, the idea of a return to an embryonic state in preparation for a physical and spiritual rebirth is introduced early on in the scriptment when representatives of his brother’s employer explain the avatar programme to Sully. His twin brother’s DNA was used to “create an in-vitro embryo”, an alien-human hybrid, which will grow to maturity during the journey to Pandora. There it was meant to be remotely controlled by his brother, but now, they tell Sully, this can be his job. His acceptance of this offer eventually leads to his rebirth in the body which that “in-vitro embryo” has grown into. Whether Cameron was aware of it or not, his favourite movie and the novel associated with it seem to have exerted a considerable influence on the themes (environmental change, threats to humanity’s existence, transformative encounters with an alien intelligence), structure (death at the beginning, rebirth at the end), and imagery (newborns/embryos, opening eyes) of the Avatar story he first set down on paper in 1995. However, my attempt to outline key similarities also serves to highlight a major difference with intriguing implications for the forthcoming Avatar sequels. At the end of 2001 the Star-Child returns home (so as to save humanity, as the novel suggests) whereas Sully is last seen in an alien body on a distant moon, while, it is implied, humanity’s destruction of its home continues unabated. Surely, the sequels will have to bring the story to a proper conclusion, whereby, even if Sully never returns to Earth, humanity will eventually learn a valuable lesson from its encounter(s) with life on Pandora, a lesson that may help ensure its survival. As with everyone, scholars approach the world around them with preconceived notions in mind. These may be genuine insights from previous research or carefully worked out hypotheses to be tested or indeed something more like prejudice. If we are not careful, in our research we may be inclined primarily to look for confirmation of what we think we already know or what we think we can accurately guess, selecting from the vast amount of potential evidence available to us only that which seems to fit our previous insights/hypotheses/prejudices, and interpreting particular pieces of evidence precisely so as to make them fit. As mentioned earlier, in that book I also suggested that the success of 2001 had prepared the ground for the later rise of Science Fiction blockbusters to (near-)dominance at the worldwide box office (by showing Hollywood that Science Fiction, a previously very marginal genre in box office terms, could make considerable money, and also by inspiring many filmmakers). No film exemplified this better than Avatar, arguably the biggest hit the world had ever seen and also the work of a self-declared fan of 2001. So when it came to selecting pictures for my BFI volume in the early months of 2010, it made sense to illustrate the link I had proposed with a poster for Avatar. Of all the posters available on the Internet, I selected the one that evoked 2001 most directly, insofar as it showed the lower third of a very bright, partially cloud covered planet in the upper third of the picture, and below it the blackness of space, dotted only with tiny stars, except for a little bit of text, made up of the tagline “An All New World Awaits”, the film’s title and credits, and the release date (here “May 2009”, which led me to conclude that this was a very early poster design). If one were to remove the text, I thought, the image would almost look like it was taken from the beginning of the “Jupiter and Beyond the Infinite” sequence of 2001 or from the film’s very ending. Indeed, the poster deeply resonated with one of 2001’s most distinctive features, namely the film’s unusually strong and extensive foregrounding of largely black, empty space and of celestial bodies (the sun, planets and moons) positioned within it and presented (not just in the two sequences just mentioned but also in the opening credits and during the trip to the moon) with an emphasis on their relationship with each other or on spacecraft circling or approaching them. I thought that both the poster’s design and the aesthetics of 2001 were picked up on nicely in the opening sequence of Avatar, which, among other things, focuses on the spectacular display of planetary bodies and on a huge spacecraft moving around in their vicinity. Later in the film a planet can often be seen hovering (in the upper half of the frame) like a giant moon in the sky of Pandora, thus echoing a key aspect of the composition of the poster (the planet at the top of the image). For several years, Cameron evoked 2001 (as well as Star Wars) so as to build up the expectation that Avatar was going to be another landmark in film history and a truly transformative experience. While it is difficult to determine how important references to 2001 were for Avatar’s prospective viewers, the overall marketing message that Cameron’s new blockbuster was going to be very special indeed would have been difficult to ignore. And although great expectations can easily give rise to huge disappointment, it is important to note that, judging by the film’s extraordinary global box office success and the huge amount of academic and other writing it generated, and in particular by various studies of the film’s audiences and its use by political activists, Avatar has been able to deliver on the promise of its marketing. It is a landmark film which has affected many people very deeply, much like 2001 did in the late 1960s. With this essay I intend to make a contribution to both Kubrick scholarship and Avatar scholarship, two large and rapidly expanding fields of study. In addition to presenting what I hope will be regarded as new insights into the complex connections between 2001 and Avatar, I have paused to reflect on what I consider to be some of the unforeseen pitfalls and missed opportunities of academic research in these fields, and also on several factors having shaped my own scholarly work over the years. Prominent among these factors are formative movie experiences (not least with 2001) and persistent fears about the very future of humanity – concerning the threat of nuclear weapons and environmental destruction – which have also underpinned, I argue, the making (as well as the cultural impact) of both 2001 and Avatar. In fact, such reflections have recently led me to conclude that perhaps as scholars, it is our responsibility not only to make the best possible use of the primary sources and scholarly literature relating to the topics we study, but also to find ways to make the results of our academic work relevant for the world beyond the academy, in the same way that filmmakers like Stanley Kubrick and James Cameron have tried – using, of course, a much larger canvas and reaching an infinitely larger number of people – to make not just the cinema, but the whole world a better place. Cp. the formative encounters film scholars Scott Bukatman and Christine Cornea had with Kubrick’s work – in these cases specifically with 2001 – which I briefly discuss in Peter Krämer, “‘Could you tell us how to create a Star-Child?’: Special Effects, Science Fiction und Publikumsreaktionen auf 2001: A Space Odyssey”, in Special Effects in der Wahrnehmung des Publikums: Beiträge zur Wirkungsästhetik und Rezeption transfilmischer Effekte, ed. Michael Wedel (Berlin: Springer VS, 2016), pp. 194-5. Also see the many passionate and thoughtful letters Kubrick received from cinemagoers, especially in response to Dr. Strangelove or: How I Learned to Stop Worrying and Love the Bomb (1964), 2001 and A Clockwork Orange. While in most cases there is no way of knowing whether a strong response to Kubrick’s films led, or at least contributed, to actual changes in people’s lives, this possibility is strongly invoked in many of the letters. For detailed analyses see, for example, Peter Krämer, “The Legacy of Dr. Strangelove: Stanley Kubrick, Science Fiction, and the Future of Humanity”, in The Apocalypse in Film: Dystopia, Disasters, and other Visions about the End of the World, ed. Karen A. Ritzenhoff and Angela Krewani (Lanham, Md. : Rowman & Littlefield, 2016), pp. 46-8, 53-4; Krämer, “‘Could you tell us how to create a Star-Child?’”, pp. 195-204; and Peter Krämer, “‘Movies that make people sick’: Audience Responses to Stanley Kubrick’s A Clockwork Orange in 1971/72”, Participations: Journal of Audience and Reception Studies 8, no. 2 (November 2011): 416-30, http://www.participations.org/Volume%208/Issue%202/3g%20Kramer.pdf. I discuss several examples in Krämer, “‘Could you tell us how to create a Star-Child?’”, pp. 195-8, and Peter Krämer, “‘A film specially suitable for children’: The Marketing and Reception of 2001: A Space Odyssey (1968)”, in Family Films in Global Cinema: The World Beyond Disney, ed. Noel Brown and Bruce Babington (London: I. B. Tauris, 2015), pp. 45-6. Rebecca Keegan, The Futurist: The Life and Films of James Cameron (New York: Crown, 2009), 10-11. Peter Krämer, “Women First: Titanic (1997), Action-Adventure Films and Hollywood’s Female Audience”, Historical Journal of Film, Radio and Television, Vol. 18 No. 4 (October 1998), pp. 599-618; and Peter Krämer, “‘Far across the distance…’: Historical Films, Film History and Titanic (1997)”, in The Titanic in Myth and Memory: Representations in Visual and Literary Culture, ed. Tim Bergfelder and Sarah Street (London: I.B. Tauris, 2004), pp. 163-72; also see Peter Krämer, “Big Pictures: Studying Contemporary Hollywood Cinema Through Its Greatest Hits”, in Screen Methods: Comparative Readings in Film Studies, ed. Jacqueline Furby and Karen Randell (London: Wallflower Press, 2005), pp. 124-32. 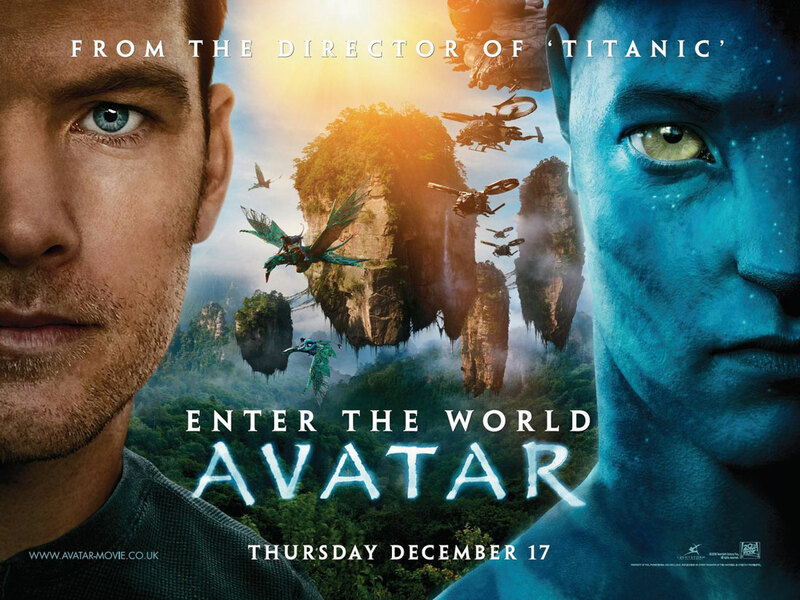 One of the papers on Avatar I presented at that time was later published as Peter Krämer, “Avatar: Environmental Politics and Worldwide Success”, Pure Movies, 6 November 2013, http://www.puremovies.co.uk/columns/avatar-environmental-politics-and-worldwide-success/. Peter Krämer, “‘Dear Mr. Kubrick’: Audience Responses to 2001: A Space Odyssey in the Late 1960s”, Participations: Journal of Audience and Reception Studies, Vol. 6 No. 2 (November 2009), http://www.participations.org/Volume%206/Issue%202/special/kramer.htm ; and Peter Krämer, 2001: A Space Odyssey (London: British Film Institute, 2010). Cp. Krämer, “Avatar: Environmental Politics and Worldwide Success”. On Kubrick, see, for example, Krämer, 2001, and Peter Krämer, Dr. Strangelove or: How I Learned to Stop Worrying and Love the Bomb (London: British Film Institute, 2015); on audience responses, see Krämer, “‘Dear Mr. Kubrick’”; Krämer, “‘Could you tell us how to create a Star-Child?’”, pp. 195-204; Krämer, “The Legacy of Dr. Strangelove”, pp. 53-4; and Krämer, “‘A film specially suitable for children’”, pp. 43-7. Keegan, The Futurist, pp. 1-2. In addition to the publications already mentioned, see, for example, Peter Krämer, A Clockwork Orange (Basingstoke: Palgrave, 2011); and Peter Krämer, “Adaptation as Exploration: Stanley Kubrick, Literature and A.I. : Artificial Intelligence”, Adaptation: The Journal of Literature on Screen Studies, Vol. 18 No. 3 (December 2015), pp. 372-82. As of yet, little of this research has been published. In addition to Krämer, “Avatar: Environmental Politics and Worldwide Success”, see Peter Krämer, “The 3-D Experience and Hero’s Journey of Avatar,” ThinkingFilmCollective blogspot, 31 January 2016, http://thinkingfilmcollective.blogspot.co.uk/2016/01/the-3-d-experience-and-heros-journey-in.html. “Declaration of James Cameron”, 31 October 2012, reproduced in full in Eriq Gardner, “Read James Cameron’s Sworn Declaration on How He Created Avatar (Exclusive)”, The Hollywood Reporter, 10 December 2012, http://www.hollywoodreporter.com/heat-vision/read-james-camerons-sworn-declaration-avatar-399979. “Declaration of James Cameron”, p. 4. “Declaration of James Cameron”, p. 6. James Cameron, Avatar, treatment, 1995, p. 2, http://www.jamescameron.fr/images/avatar/Avatar.1995.pdf. Arthur C. Clarke, 2001: A Space Odyssey (London: Legend, 1990, originally published in 1968), p. 23. For more on this, see Krämer, “‘Dear Mr. Kubrick’”. See Krämer, 2001, p. 98. “New Avatar Tagline Revealed”, ComingSoon.net, 30 March 2009, http://www.comingsoon.net/movies/news/54088-new-avatar-tagline-revealed. Ross Miller, “An Avatar Update, Including a New Tagline“, ScreenRant, 31 March 2009, http://screenrant.com/more-about-avatar-including-tagline-ross-6454/ . Liam Goodwin, “An All New World Awaits”, Filmonic, 31 March 2009, http://filmonic.com/world-awaits/. Markopolo, “Is Cinema’s New World Old News?“, These Words Are Bullets, 25 October 2011, https://tinribs27.wordpress.com/2011/10/25/is-cinemas-new-world-old-news/. https://en.wikipedia.org/wiki/Earthrise#/media/File:NASA-Apollo8-Dec24-Earthrise.jpg. Cp. Robert Poole, Earthrise: How Man First Saw the Earth (New Haven: Yale University Press, 2008). Indeed, Thomas explained that he had taken the image of the globe in the Avatar poster from a previous design of his entitled “Destiny”, which shows this very globe hovering in the sky above a sandy, Earthly landscape; http://bit.ly/2xWocvQ. A selection of official posters can be found at http://www.avatarplanet.net/posters/ and http://www.impawards.com/2009/avatar.html. The only element that might be seen as a reference to 2001 is the fact that on several posters human and/or alien characters stare directly at the camera, much like the Star-Child does at the very end of Kubrick’s film. 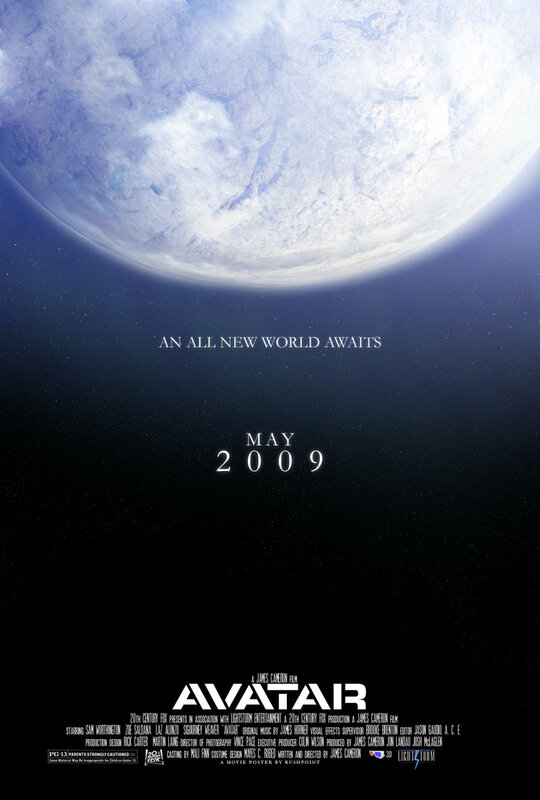 Strangely enough, one of the main designs evoked Thomas’s “Destiny”, insofar as it also showed a planet hovering in the sky above an otherworldly landscape; see http://www.impawards.com/2009/avatar_ver5_xlg.html. “Declaration of James Cameron”, p. 43. “Declaration of James Cameron”, p. 44. See, for example, Sheigh Crabtree, “Film Reporter”, The Hollywood Reporter, 7 July 2006, http://bit.ly/2yEoYec. Anne Thompson, “Cameron Sails Avatar”, The Hollywood Reporter, 9 January 2007, http://bit.ly/2yEoYec. For studies of the film’s reception, see Yosefa Loshitzky, “Popular Cinema as Popular Resistance: Avatar in the Palestinian (Imagi)nation”, Third Text, Vol. 26 No. 2 (March 2012), pp. 151-63; Carolyn Michelle, Charles H. Davis and Florin Vladica, “Understanding Variation in Audience Engagement and Response: An Application of the Composite Model to Receptions of Avatar (2009)”, The Communication Review, Vol. 15 No. 2 (2012), pp. 106-42; Bron Taylor, ed., Avatar and Nature Spirituality (Waterloo, Ontario: Wilfrid Laurier University Press, 2013), esp. Part II; Peter Krämer, “Connectivity in and around Avatar: From Film Analysis to Political Activism,” unpublished paper presented at the 2016 Network of European Cinema and Media Scholars Conference “In/between: Cultures of Connectivity”, Potsdam, Germany, July 2016.